BayLUG‘s annual holiday show at the Museum of American Heritage opens next Friday, and will be operating every Friday, Saturday, and Sunday through January 14th, 2018 (closed on Christmas Eve). Come check it out! On Sunday December 3rd, we set up the exhibits and had a VIP reception for the museum’s top donors. 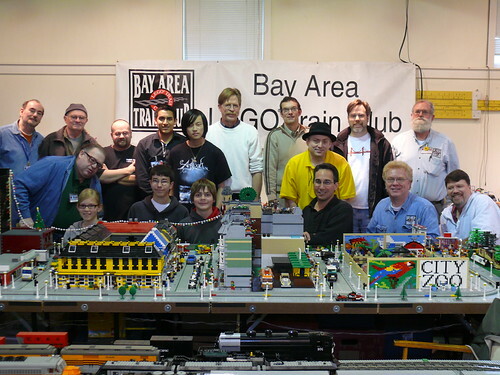 On October 22, BayLUG (Bay Area LEGO Users’ Group) put on a display at the East Bay Mini Maker Faire in Oakland, CA. We had nearly 20 members participating and occupied a whole room at the Park Day School where the event was held. Every year the Bay Area LEGO Users Group (BayLUG) sets up an exhibit at the Museum of American History (MoAH) in Palo Alto, CA over the holidays called “Living LEGO-cy.” This year was our 9th annual show. Here are some pics I took on the last day of the show just before teardown. Click the image to view the rest of the photos, or view a slideshow. The last day of BayLUG‘s annual “Living LEGO-cy” show and teardown took place on Sunday, January 15th. My pictures are available online. This is an event we do every year at the Museum of American Heritage in Palo Alto, CA, as a fundraiser for the club and for the museum. This year we had excellent attendance, with a peak of 841 people coming through on the 30th, which was the most people we’ve had in one day since we started keeping track (and charging $2 admission). Here’s a group photo of club members taken during teardown. Click the photo to see the rest of the images, or view them as a slideshow. Our next event is the Train Collectors Association Cal-Stewart Spring convention, open to the public on Sunday March 4th, from 10:00am-2pm. It’s a toy train show and one of our favorite events of the year. Two weeks after that is the Bricks by the Bay 2012 convention – the convention runs Friday through Sunday, March 16-18, and is open to the public on Sunday the 18th. There are only three days left in the show: Fri-Sun, January 13-15. If you haven’t made it out there yet, best do so soon! 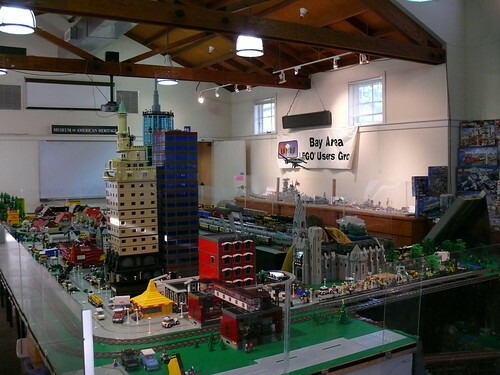 This weekend we (the Bay Area LEGO Users’ Group) set up our annual “Living LEGO-cy” show at the Museum of American Heritage in Palo Alto, CA. The show is open to the public Fri, Sat, and Sun until January 15, 2012 (except holidays). Admission is $2. Come on by! You can also view the pictures as a slideshow. 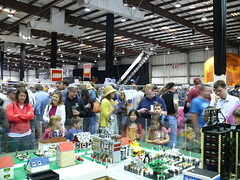 My local LEGO club, the Bay Area LEGO Users’ Group, has been displaying at Maker Faire every year since it started in 2005. Maker Faire is an amazing event, full of all kinds of creativity, from knitting to robots to welding to music. A lot of the art cars and artistic displays that Burning Man is famous for can be seen at Maker Faire in a much more pleasant climate. Regardless of your hobby, it’s a hobbyist’s paradise. And if you’re ever looking for a new hobby, it’s the perfect place to find one. We had just over 20 club members participating to some degree, at various points during the setup and event. We set up the tables and displays Friday afternoon and Saturday morning, and opened to the public at 10am Saturday. I have no idea how many thousands of people came through, but the crowds were nonstop all weekend. The show wrapped up at 6pm last night and we quickly tore down and packed up the display. We had a 40′ by 50′ space set aside for our club to use, and we divided that up into four distinct areas. In one corner we had a train/town layout, which is where I spent most of my time. We had a downtown area with buildings, cars, trucks, etc. I had two blocks, one featuring my Blackburn Hotel and other buildings, and the other with my City Park. We also had a suburb full of houses and smaller businesses, and a train yard for storing the trains that weren’t running. Inspired by the Log Cabin set, we had a little campground area featuring two of those cabins and one large one that I made out of three of that set. I also parked my RVs in that area, and we had a lake with an island full of bison/buffalo in the middle for reasons I don’t really understand, but they were cool buffalo. I called them the water buffalo. There was a large open space on the layout which we filled with creations built by kids in our MOC building area (see below). Besides the town/train layout, we had a row of tables along one side with all sorts of other creations by our club members, including some of my sculpture pieces, Marcello’s Japanese Navy WWII ships, Charles’s spaceships, some Technic creations by Jeremy, and some of my assorted models including the big yacht and some of my 7-wide cars. 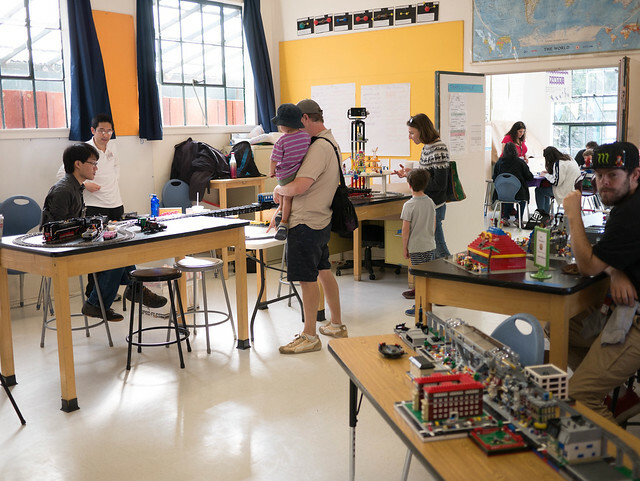 The other two corners of our space were devoted to a MOC building area and a Mindstorms demo area. In the MOC building area, we had bulk LEGO parts dumped out on the floor and kids of all ages were invited to build whatever they liked out of the parts. 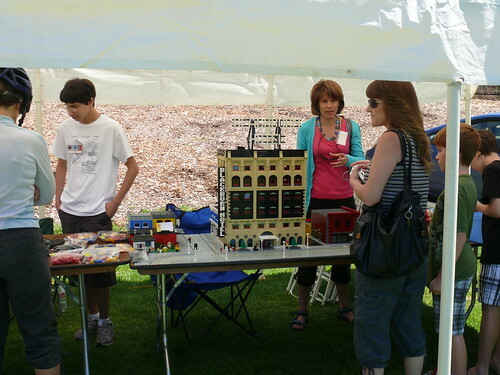 We displayed the parts on the train layout so that the kids could contribute to our display. The Mindstorms area featured live demonstrations of robots of various types run by Eva and Steve, who worked tirelessly all weekend showing the robots off to the public and teaching them about LEGO robots. To see what it all looked like, click the photo below or click here for a slideshow of all the pictures. 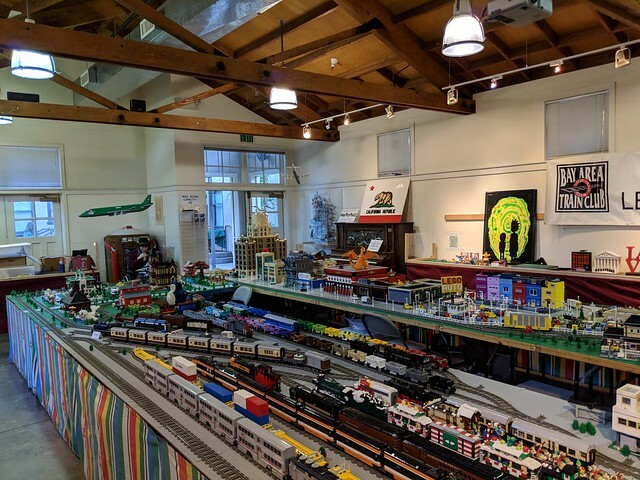 Yesterday was the last day of the BayLUG/BayLTC show at the Museum of American Heritage in Palo Alto for another year. We had hundreds of people come through to admire the exhibit including a few friends of mine. The show is called “Living LEGO-cy” and this was the 7th time we’ve had it. For the first 5 years it was free, but then in 2008-9 the crowds were totally beyond our ability to manage, and it taxed the museum’s and our ability to handle, without any benefit to either institution. So we started charging $2 per person last year, enabling BayLUG to provide a loan to support the startup of Bricks by the Bay’s first convention. This year we kept it the same, though BBTB no longer needs the financial support, and raised a tidy sum for both the museum and the club (who split the income 50/50). Click the photo above to see all my pictures from the event, or you can view a slide show of the images. See also the opening weekend post I made last month. As in previous years, we filled the room with LEGO. In the center was a 12′ by 25′ train layout, and all along the sides of the room we had various miscellaneous LEGO exhibits on all types of themes. A few of us had some space to sell LEGO and LEGO-related accessories – I got rid of a bunch of sorting containers I no longer use (tackle boxes and stackable containers) and some bags of parts that I didn’t need; others were selling whole sets and minifigs and other small items. We also used this as an opportunity to solicit for new club members, which we had several of, and to distribute flyers for Bricks by the Bay 2011, and lots of people said they would be there. If you missed out on this exhibit, a similar one will form a centerpiece for the Bricks by the Bay exhibit hall. Hope to see you there! Click the picture for the photos, or browse a slideshow. 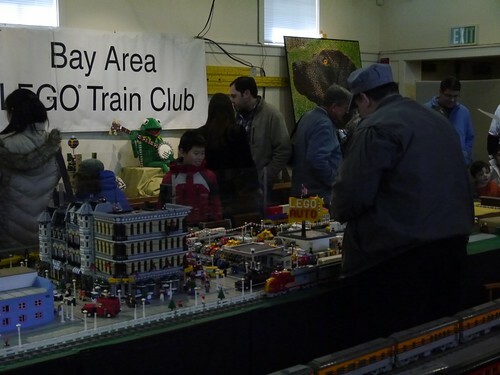 This was the opening weekend for the the Brick Show in San Leandro, CA at the Bay Area Family Church, organized by Johannes van Galen and featuring BayLUG/BayLTC. The show is ongoing through July 25 so come on out and check it out! 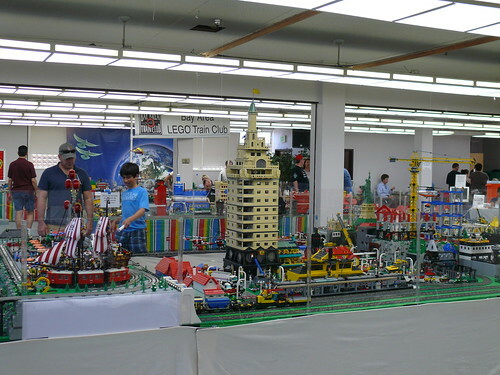 The show features a large train layout and various other displays in all themes of LEGO. Admission is $5 each for adults (age 16+) and $3 for kids ages 3-15. Kids under 3 are free. You can also view the pictures as a slide show on Flickr.